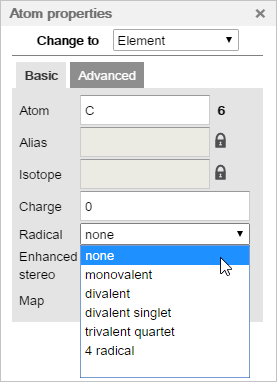 You can select radical electrons from a predefined list in the Atom properties dialog, which is available via the Atom or the Selection context menu. Set radicals manually with the Increase radical button on the Tools toolbar. With successive clicking on the atom, you can increase the number of the radical electrons until four. For the fifth clicking, all of the unpaired electrons will be removed. When automatic lone pair calculation is active, the correct lone pair count will be assigned to the atoms on the canvas. Please, note that lone pairs are only visible when the 'Show lone pairs' option is checked in the View settings dialog.